Oxtails are beef tails (although the name implies otherwise, no specific breed of cow is used), and they make the most delicious soup. While some people may balk at the idea of eating a cow's tail, this recipe may change their minds. Oxtail is often used on its own to make beef stock for many soup recipes as it's known to be a gelatinous rich meat that is great for stews. There are several different regional versions of this dish; the British recipe is made with onions, carrots, celery, and thyme. The soup does need a lot of time to simmer because of the fatty meat​ but requires little work. Once you taste the soup, you will see that the result is well worth it. Dredge oxtails in the 1/2 cup flour. Heat the beef drippings or cooking oil in a large, heavy pot over high heat. Cook to brown the meat, remove (keeping the fat in the pan), and drain on paper towels. Add the minced onions to the pot, turn the heat to medium, and saute 8 to 10 minutes until golden. Sprinkle in remaining 2 tablespoons flour, mix well, and brown lightly. Slowly add the water, and stir in tomato paste, salt, and pepper. Tie the bay leaf in cheesecloth with the thyme, cloves, and parsley and add to the pot. Return oxtail to pot, cover, and simmer 3 hours until meat is fork-tender. Cool and skim off fat; remove cheesecloth bag. 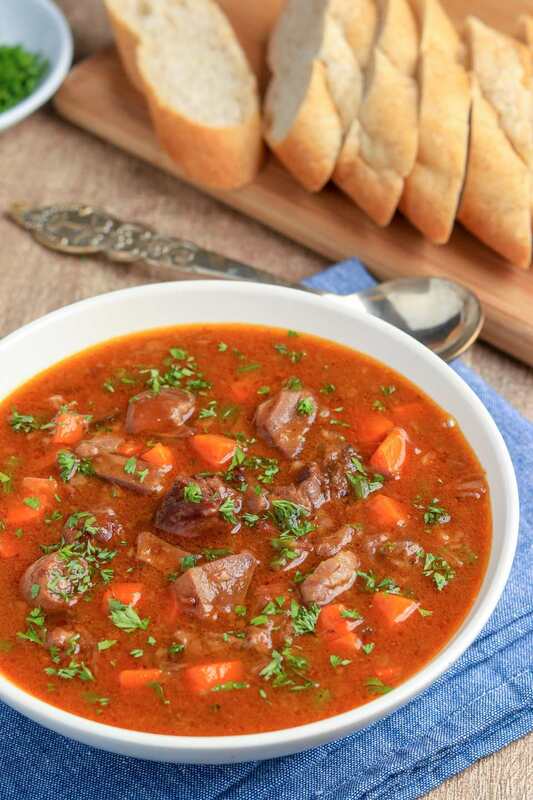 Remove the oxtail from the soup and separate the meat from the bones; cut the meat into bite-size pieces and return to pot along with carrots and celery. Cover and simmer 10 to 15 minutes until carrots are tender. If you like, mix in sherry or port. Serve as is, or strain the liquid and serve as a first course; follow with oxtail and vegetables. It is believed that this recipe was created in the 1700s in London by French and Flemish immigrants. Given their long cooking time and high-fat content, oxtails were traditionally a very cheap cut of meat often associated with the poor. It's now a popular dish in many countries such as China, Korea, and Indonesia. The American south also has several variations of this popular dish. Currently, oxtail soup is a popular canned dish in the United Kingdom, but nothing beats homemade. This recipe comes from The New Doubleday Cookbook by Jean Anderson and Elaine Hanna.